The heritage of Sealy Posturepedic is built on support. For over 60 years Sealy has been designing mattresses with this in mind; the all-new Sealy Posturepedic is no exception. Sealy asked if there was a way to think of springs differently. They realized a lot of living happens in bed, and support is more than just science and backs. Sealy Posturepedic is the only mattress supportive enough for whatever you do in bed. The all-new Sealy Posturepedic mattress collection is designed with you in mind. Models feature three key features that support whatever you do in bed. The Posturepedic CoreSupport Center, which provides additional support where you need it most. The center third of the mattress (the area that holds the heaviest part of your body) is power-packed to maximize support and enhance all your bed-time needs. The CoreSupport Center is also designed to reduce body impressions so your mattress feels the way it did the day you brought it home, after ten years. The SitRight Edge System is designed to provide a solid seating edge and optimal flexibility for use on adjustable base foundation systems. It increases the usable sleep surface by 10 to 20%. The form fitted design reduces bounciness, improves support and enhances stability, resulting in longer uninterrupted sleep. The StayTight Foundation is a rubberized foundation cover that holds sheets in place and stops the mattress from shifting. Mouse over the different parts of the mattress to learn about the different features. 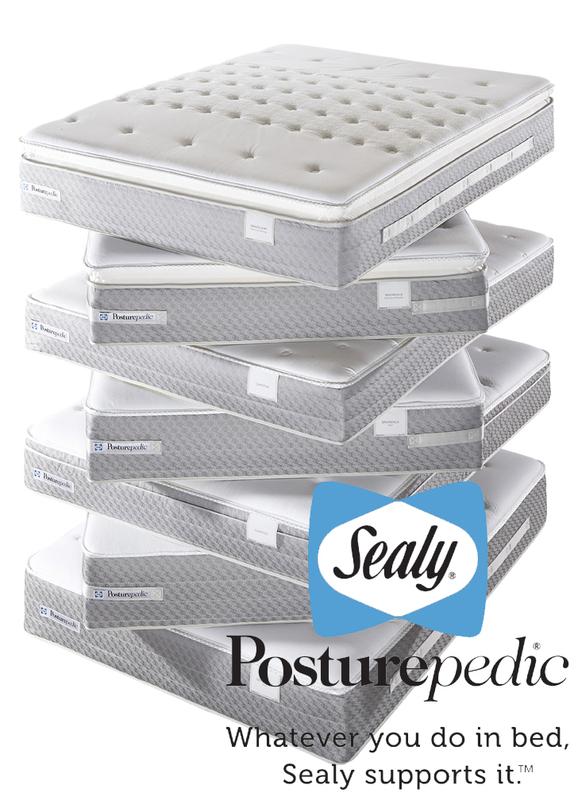 Sealy Posturepedic introductory models features Titanium Ss coils with LiftRight handles. Titanium Ss coils brings the strength of Titanium to an improved coil design. It provides best-in-class Sense and Respond support. 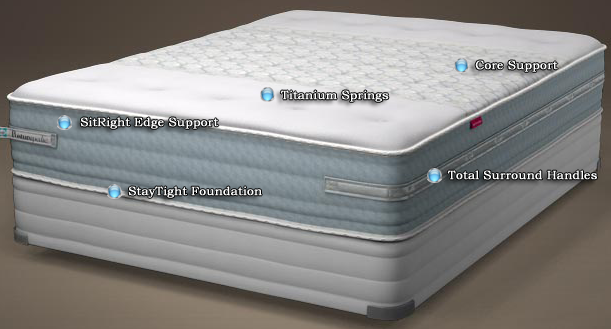 Likewise all of Sealy’s coils are twice tempered to retain its support characteristic for the life of your mattress. LiftRight handles are strategically positioned all along the edge of the mattress, making lifting the mattress a breeze. Sealy Posturepedic advanced models feature Sealy’s Titanium DSx innerspring system. The DSx coils are designed to optimize performance with one-sided mattress. The Dual Stage coil design provides Sense and Respond support on a new level of individual conformance. The LiftRight Surround handles are a unique design allowing you easy access to lifting the mattress even through the sheets. With superior comfort and durability, the Titanium SS single-stage coil design provides extensive support for all your bed-time needs. This unique bar handle design allows for multiple gripping points, making maintenance of the mattress easiest than ever. The latest and advanced coil design, the Titanium DSx is the only single coil innerspring that gives you dual stage conforming support on the surface and deep-down support underneath. Surround Handles offer a unique wrap-around handle design that provides easy gripping access, including the corner of the mattress, making everything from moving the bed to changing the sheets easier than ever.